In less than one day over 4,000 professionals gather at the 2016 Esri Federal GIS Conference (FedGIS), February 24-25, to explore ground-breaking ways government uses geospatial technology to solve the world’s greatest challenges. Join our community and Esri President, Jack Dangermond, to explore the future of GIS and hear from accomplished federal government leaders about their ground- breaking projects and roadmaps to success. Esri tech experts will also show you advances in GIS technology and how you can use the latest tools today. The conference hosts two plenaries, Wednesday and Thursday, featuring special guests such as Keynote Speaker, Susan Gordon, Deputy Director, National Geospatial-Intelligence Agency, and speakers from the National Park Service, U.S. Department of Homeland Security, U.S. Department of Transportation, USDA Forest Service Forest Atlas and more. We’re confident you will walk away inspired and ready to change the world with geography after hearing from these accomplished government and technology leaders. The conference will also feature professional development workshops, hands-on learning labs, and Esri Young Professionals Network sessions and networking opportunities. 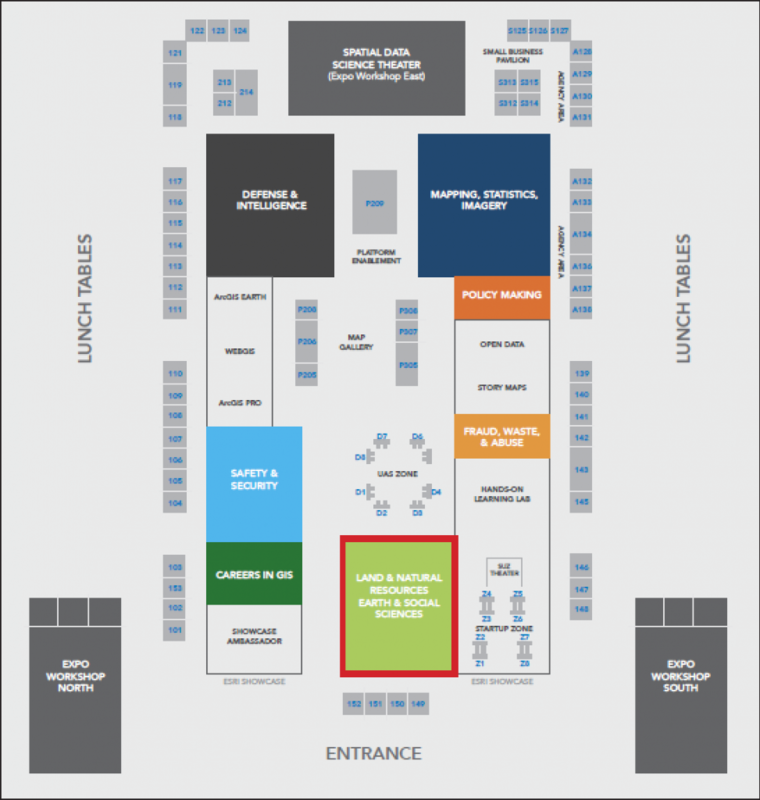 Don’t miss the GIS Solutions EXPO and Showcase where you can connect with Esri’s technical experts and collaborate with exhibitors. With dozens of exhibits to explore, this is your best chance to get up to speed on the latest Esri technology and learn more about your fellows. We will guide you through focus areas that correspond with Immersion Summit topics, such as defense and intelligence, natural resource management, and policy making, so you can easily find the subject matter experts to whom you’d like to talk. You can also meet with a multitude of government agencies who can help your business grow and browse the Startup Zone, where members of Esri’s Startup Program Emerging Partners will share their innovative solutions and apps. If you haven’t registered, we encourage you to join us and share ideas, discover new trends, and learn how GIS can help us all understand our world and make a difference. Continue to monitor the website, esri.com/fedgis, agenda (don’t forget to download the app), and engage on social via #FedGIS and @Esri. See you in DC!